The energy minister is doing it. David Cameron's doing it. People are blogging it. Is DIY power generation going to be the next big thing? Solar panels and miniature wind turbines could soon become an officially-promoted part of the urban landscape. Soaring energy bills, fears about insecure fuel supplies and concerns about climate change have already encouraged a growth in green energy schemes. This week MPs will vote on proposals which would make it significantly easier for householders across the UK to generate their own power. Tory moderniser, David Cameron, already has plans for a wind turbine on his London home while Energy Minister Malcolm Wicks also wants to install his own mini-windmill. And the Climate Change and Sustainable Energy Bill, which is facing its final parliamentary hurdles when it comes before the Commons on Friday, has got all-party support to promote "micro-generation", such as solar and wind power. The bill would introduce official targets for the growth of micro-generation - and there would be a "buy-back" regulation in which householders who produce a surplus of power would be paid a fair price by energy suppliers. Planning obstacles for small-scale renewable energy schemes would be reduced - and to meet targets, it's been suggested local authorities could provide financial incentives for using renewable energy. Labour backbencher Mark Lazarowicz, who is sponsoring the bill, says the "whole political atmosphere has changed" in the debate over energy and climate change. "The argument isn't any more about whether we should use more renewable energy, but how we do it," says Mr Lazarowicz. Adding to the political pressure will be the government's own strategy on micro-generation, due to be published before the end of the month. One problem for householders wanting to erect wind turbines and solar panels is getting planning permission, and the energy minister is expected to make this easier. Mr Wicks, as well as wanting to stick a turbine on his own roof, has already pointed to the benefits of micro-generation. "Before the advent of large-scale power stations, self-sufficiency in energy generation was the norm - water mills used to grind corn, coal-fired boilers providing heat. Advances in technology mean that products are now available that allow the individual to regain this self-sufficiency," Mr Wicks has argued. So how would any of these energy schemes work in practice? Rowan Langley, who lives in north-west London, is ahead of the micro-generation game. 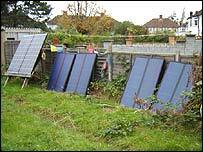 He set up a solar power generation system in his back garden, which produces between a third and a half of his electricity. The panels cost about £400 to £500 each, he says. This provides enough power for his basic needs, such as lighting and running appliances, like the fridge and television. If he wants to run something that needs more power, such as a washing machine, he switches to the mains supply. "It cost me the same as a big plasma TV would have done, but it is saving rather than costing me electricity," he says. To share his experiences and to help others, Mr Langley has his own solar power blog [see Internet Links, above, right], recording how his DIY power system still functions on dark days in winter. As well as cutting his fuel bills, Mr Langley sees this as a way of putting his environmental principles into practice. And he enjoys the independence of being able to generate his own power. "When it comes to decommissioning - think of the problems of a nuclear power station. Decommissioning my power station will mean packing it away - and maybe selling parts of it on eBay," he says. The nuclear industry, for its part, supports renewable energy - but says it cannot alone provide for all the country's energy needs. 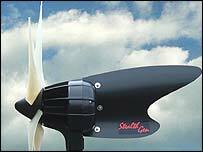 The type of wind turbine that Mr Cameron is reported to be seeking is the D400 StealthGen, produced by the Nottingham-based Eclectic Energy, and costing £2,200 plus another £400 for installation. The company's managing director, Peter Anderson, says there has been a huge surge in interest in these turbines, which have been designed specifically for unobtrusive, residential use. The translucent rotor blades are 1.1m in length and Mr Anderson says they are very quiet when operating. An individual turbine should provide about a fifth of electricity needs - and it operates seamlessly with the mains supply. Fashion might be part of the rising interest, as he says that for some people it's a "lifestyle statement". For others, it's an expression of their environmental belief and for some it's a way of getting themselves a self-sufficient power supply. But we shouldn't be complacent. Keith Barnham, professor of physics at Imperial College London, says that the UK has already been "crazily" slow in its development of solar power - and that so far we have had a poor record on serious sustained investment. Research investment is seven times greater in nuclear power - and he says that Germany, with similar sunlight levels, already has 30 times more solar panels on its roofs. If the Germans continue to expand solar power at the same rate, in another six years they will be getting more electricity from solar power than the UK gets from its nuclear power stations, says Professor Barnham. Increased investment in solar power would make the technology more efficient and cheaper, he says, in the way that mobile phone and computer technology has accelerated. "We've already fallen badly behind," says Professor Barnham. We've had solar panels for our hot water for a couple of years, we've yet to dabble in the power cells for elecricity - but we're not wealthy, by any means. Soon, they'll pay for themselves, and that was our incentive. We like saving money, and we don't like destroying the world we live in. If there needs to be a bigger incentive than that, then we really do have a problem. About time too. I have wanted more people to use renewables since 1991 when I first became aware of long-term sustainability. There should be grants available - it'll cost a lot less in the long term! We have a solar heating system on our roof that generates all our hot water in summer and contributes significantly on bright winter days. I'd have thought it should be complusory on all public building. Just think of the savings if you heated swimming pools this way! Along with solar powered street lights, wind-powered motorway warning signs. The easier these things are to buy and install, the more people will buy them...they're a sound investment as all the time they're running, they are saving money and not polluting the atmosphere. When B&Q starts stocking them they will have arrived. About time too! There is so much potential for micro-generation, add some extensive energy efficiency and we can seriously cut our energy use with no pain. Anyone want to start a campaign to get rid of standby on televisions? All electricity here in British Columbia is generated bu hydro-electric generators: consequently, we have some of the cheapest electricity in North America. Investment in green and renewable energy sources is the right thing to do: the question is why it's taken so long to do it. I think it's a great idea, and should be adopted nationwide - at first the technology should be subsidised to promote take-up, but eventually the cost of manufacture would go down as demand rises. 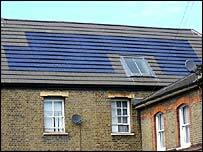 The other fundamental concept I would promote is solar panel roof tiles - instead of solar panels being placed on top of roofs, they should be built in as the roof on new build houses. At the moment, a possible reason why planning applications fail is because they are sometimes unsightly - which can easily be remedied. 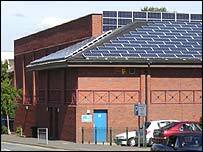 I would love to use solar/wind generation but I live in a listed building in a conservation area, so I have no chance! Cost is the major factor. If a wind turbine could save me a fifth to half of my electricity usage, and cost only £300, I would seriously consider them. But at the moment at £2,000+ the cost is totally out of most people's league. 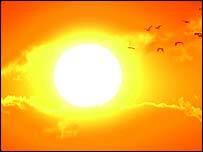 Why hasn't the government made it compulsory for all new build houses to have some sort of solar system fitted? With the number of houses John Prescott is inflicting on us this could make a vast difference to our energy and environmental problems.